Leading Muslim Scholar Tariq Ramadan Denied U.S. Visa to Teach at Notre Dame | Democracy Now! The United States has denied entry to one of one of Europe’s most influential Islamic thinkers. Tariq Ramadan, a Swiss scholar known for his work on Islamic theology and the place of Muslims in the modern world, was appointed to teach Islamic philosophy and ethics at the University of Notre Dame. He received a visa from the State Department and was scheduled to start his classes in late August. But just days before he was set to travel, his visa was revoked without explanation at the behest of the Department of Homeland Security. Tariq Ramadan, professor of Islamic studies and philosophy at Fribourg University in Switzerland. He is the author of “To Be a European Muslim” and “Western Muslims and the Future of Islam.” He has been described by Time magazine as one of the 100 most likely innovators of the 21st century. Scott Appleby, director of the Joan B. Kroc Institute for International Peace Studies at the University of Notre Dame in South Bend, Indiana. AMY GOODMAN: Tariq Ramadan joins us on the phone right now from Freiberg University in Switzerland, professor of Islamic studies and philosophy. He’s authored the book To Be a European Muslim. He has also written Western Muslims and the Future of Islam described by Time Magazine as one of the most 100 likely innovators of the 21st Century. We’re joined by Scott Appleby director of the Joan B. Crock Institute for International Peace Studies at the University of Notre Dame in South Bend, Indiana. We welcome you both to Democracy Now! For listeners and viewers who didn’t get a chance to hear the beginning of our conversation, Professor Ramadan, can you describe what happened? You were first granted a visa and then denied that visa? TARIQ RAMADAN: Yes, I went first in last March to the American Embassy in Switzerland and filed a petition. I had had to wait for two months while there was a clearance procedure. I had had to go again to Washington and then I was called and I received an email in up a rill telling me that — informing me that it was okay. I went in May and I received a visa, which — H-1 visa to — which is the — you know, the permission for me to go to the states and work. AMY GOODMAN: Professor Appleby, Director of the Crock Institute for International Peace Studies at University of Notre Dame, how unusual is this? SCOTT APPLEBY: In this case it’s quite unusual because of the way in which this was done. As Tariq said, he had been cleared, his petition had been approved, the visa had been approved and issued, and at the last minute, it was revoked. I don’t know of a precedent for that kind of manipulation. There have been visas denied, and people from various background and various nationalities under the PATRIOT Act, who have been denied access to the United States, without due process, but this seems to me to be a striking case of an intervention at the last minute without explanation. AMY GOODMAN: Has this ever happened at the University of Notre Dame? Have you ever been in this situation before? SCOTT APPLEBY: We have never been in this situation. There have been people denied entry into the country at Notre Dame, as elsewhere, I believe, but nothing of this magnitude because Tariq is such a well known person, and was known before the initial visa was issued, and there were accusations hurled at him, and he had been exonerated and had defended himself, and we still have no substantial evidence of any of the various things that have been said about him. So, it’s created for Notre Dame a crisis in that we are now faced with trying to answer charges that haven’t been leveled in any specific way. That’s impossible. And we’re embroiled in, as is Tariq, a back and forth media debate, which in my opinion is not always the best way to get at the truth because so many elements in parts of our media are driven by this or that agenda, and so you spend a great deal of time and effort focusing on issues that are not really at the heart of the matter. So, I think Notre Dame is learning a lot from this, and we stand behind Tariq fully, and are proud of the appointment, and believe and continue to believe it’s the proper appointment. We look forward to a reversal of the decision or some kind of communication, more solidly about the rationale behind the decision. AMY GOODMAN: I’m looking at a piece by John Tierman of Alternet or that was distributed by Alternet, and it says that they don’t think that Professor Ramadan’s appointment to a major university would have been challenged if it weren’t for the intervention of anti-Muslim groups, Graham Fuller, a middle east expert, a senior Rand Analyst and former Vice Chair of the National Intelligence Counsel told the Chicago Tribune quote, “pro-Likud organizations want to block people who can speak articulately and present the Muslim dilemma in a way that might be understandable and sympathetic to Americans.” In talking about the Arab-Israeli crisis, he said, “They succeed by present this as a security matter. There is no way homeland security would initiate this on its own.” Your response? SCOTT APPLEBY: Are you speaking to me? AMY GOODMAN: Yes. Then I’d like to get Professor Ramadan’s response. TARIQ RAMADAN: Sure. 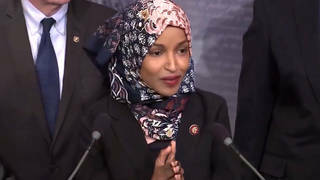 You know, I’m just trying to rely on the facts, and my position is to say oh okay, I — you know, we heard so many things about, you know, me and some other Muslim scholars, so I got the visa, and this meant that nothing was in my file, and that I was — I had been exonerated, as you said. I know that some voices in the United States said be careful with this Muslim scholar. Many were not happy with my comments. Some pressures occurred before. This is — I knew that, and everyone knew that. The question now is really this one — we are dealing here with academic freedom. I have a voice, which is a strong voice, but once again, I’m against all kinds of terrorism and I am against all kinds of violence. I’m trying to build bridges between Muslims and the Islamic world and the west to tray to promote this living together. So, now it’s possible at the highest level to take such a decision under some pressure, I think that really for all of the citizens in America, it’s really very important question. Is this the way we are trying to deal with the Islamic world, and if we have a kind of pressure we can just ban someone? I think it’s the heart of the question. The point is that so far, we have no explanation coming from the U.S. administration. So, all of this kind of, you know, hypothesis and people speaking about this, it’s done. It’s here, but I don’t have the final word why this visa has been revoked. AMY GOODMAN: We’re speaking with Professor Tariq Ramadan a Professor of Islamic Studies, as well as Scott Appleby, Director of the University of Notre Dame’s Crock Institute for International Peace Studies where Professor Ramadan was scheduled to begin teaching in August, that’s this past August. We’ll be back with them in just a minute. AMY GOODMAN: This is Democracy Now! democracynow.org. I’m Amy Goodman. Professor Tariq Ramadan is our guest, Professor of Islamic Studies and Philosophy, supposed to be teaching at the University of Notre Dame, but the department of Homeland Security has revoke his visa. Scott Appleby, also with us from the University of Notre Dame, South Bend, Indiana, director of the Joan B. Crock Institute for International Peace Studies, where Professor Ramadan was expected to teach. I asked professor Ramadan the question, let me put it to you, Scott Appleby, the issue of it not being — that this being political decision about professor Ramadan’s dawn’s views on the Arab-Israeli peace process and not wanting that kind of discussion here? SCOTT APPLEBY: Well, I should say that we don’t know what the steps were to take this intervention to deny Tariq his visa. And it would be foolish for us to speculate that this or that group — or to say that this or that group intervened because we simply don’t know. What we do know is what Tariq said, that various groups and individuals have spoken out both in Europe and in the United States against Tariq, and have hurled all kinds of charges that are really shameful because they have been disproven. They’re being repeated. There is — I spoke to one reporter who said, I’ve talked to various people who are opposed to Tariq Ramadan, and they just are avis orally opposed, but when you ask them what specifically about him — what has he done or said, they don’t really have a good specific answer. But Tariq represents for them, unfortunately, what they fear, their anxieties, that is, there’s a fear that Islam is not to be trusted, and articulate spokespersons for Islam, who are also not willing to abandon elements of the Islamic identity that would be a challenge to the west, and who are willing to criticize U.S. and European policy where social justice demands, compels them to criticize and who don’t back down from controversy. Well, this can be perceived by people who have real anxieties, real fears as a vanguard of some kind of subversion that links up in their minds with historic and categorical fears. As a result, someone who is as prominent and articulate and focused as Tariq Ramadan becomes the focus of a lot of unfocused anxiety and charges. So, what group or individuals specifically are behind this, we don’t know. We wouldn’t care to speculate. But it’s — it’s hard to imagine as Fuller said, that homeland security was not pressured in some way, the way this was done, the way it was set up, to try to embarrass Tariq Ramadan, and to try to make a larger political point about his appointment, that really goes beyond anything specifically about him. AMY GOODMAN: One of the issues that you have addressed, Professor Ramadan, critics — the critics are led by Daniel Pipes, is that you said that there were questions about Osama Bin Laden being behind the September 11 attacks. You go point by point addressing Daniel Pipes’ criticisms. What is your response to that? TARIQ RAMADAN: You know, I responded to all of this, and these are all very, you know, allegations that I have heard before in Europe. As to this, what I said — you know, I made different statements just before September 11, the same day and the day after, so when I was speaking to Muslims saying that maybe we don’t know — because we were still, you know, just — in the U.S. There was still discussions about who did it. But my point from the very beginning was clear, and even two weeks later when I came to New York, invited by the New York Times Magazine, and I had discussions that I was saying that — straight after the event I said, “we don’t know maybe who is behind it, but us as Muslims, we have to say that we know that some Muslims can say and are saying that you can kill an American, a Jew, a Christian only because he or she is an American, Jew or Christian, and this is not acceptable. We have to condemn this. So, we have to condemn the terrorist attacks in New York and we have to say that as Muslims, this not acceptable. Then with, in time that it becomes clear that we had more information, my position was clear without any kind of, you know, trying to say that maybe it’s not Muslims, and that we have not to accept or condemn, make a condemnation of it. And I told the Muslims don’t get away from that. This is your responsibility to say as Muslims that some Muslims are betraying the Islamic message. AMY GOODMAN: Final comment, Professor Ramadan, as you at this point — at this point, what are you doing, awaiting word again? Are you teaching now in Switzerland? TARIQ RAMADAN: No, I am not teaching because I left everything here. You know, everything is in the States, and I’m still hoping that this decision is going to be reconsidered. I’m very happy with the stand the university of Notre Dame, with Scott and all of the people around, very supportive and in the states to tell you the truth so many organizations, Muslim and non-Muslim organizations speaking out and saying this is a serious matter, and that we have to try to find a solution. I’m waiting for the solution. My only hope now is to very soon to be at Notre Dame University with my whole family, and to try to start this new life we wanted to start. So, this is the hope. We are still trying to find a way to be in touch with the administration, to have an answer, and I’m so sure that there is nothing in my file that this solution, this mistake is going to be reconsidered, and a solution found. AMY GOODMAN: Professor Ramadan, I want to thank you for being with us, professor of Islamic Studies and Philosophy at Freiberg University in Switzerland, now appointed professor at University of Notre Dame in South Bend, Indiana. We will continue to follow your case. Also, Scott Appleby, Director of the Joan B. Crock Institute of Peace Studies at the University of Notre Dame in South Bend. Thank you for being with us. You are listening to Democracy Now!